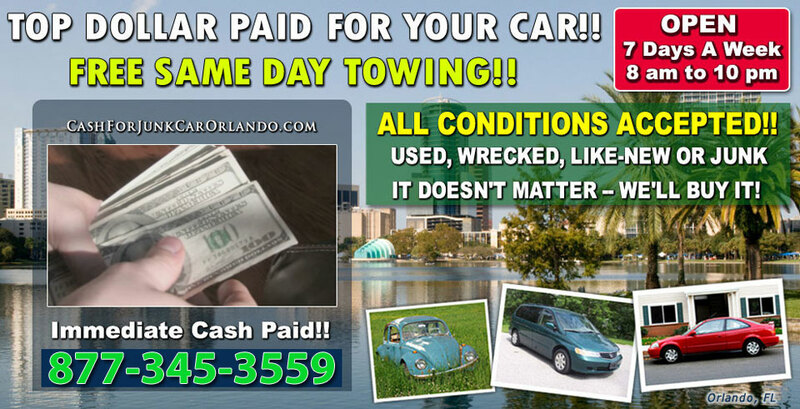 Not only do we offer free vehicle removal, we also show up on time, are professional, and can usually offer a little cash for your junk car. The vast majority of the cars we buy were either severely damaged in an accident or need repairs that are far greater than the value of the car; so called junk cars. Whether it's wrecked by the side of the road or dead in your driveway, we offer fast and free vehicle removal. When the cars we pick up are repairable, we'll often be able more than a token cash payment, but our vehicle removal is free even if you car is 30 years old and hasn't run in twenty. Please don't hesitate to chat with us live or drop us an e-mail. We have extended business hours Monday through Saturday, and we can usually arrange to provide vehicle removal service within 24 hours. We may even be able to put a little cash in your hand.